Historically, immune and inflammatory responses associated with pyrexia have been implicated in host defenses against infection and neoplasia (Pettigrew and Ludgate 1977; Robins and Neville 1986). Early clinical studies by W.C. Coley, in the 1890s showed that significant tumor responses could be achieved by injecting bacterial filtrates into patients with advanced malignancy. 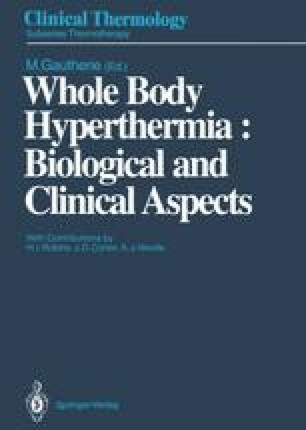 Moreover, since some patients appeared to develop a tachyphylaxis to the pyrexia induced by the injected “toxins,” the hypothesis arose that tumor destruction was not solely the result of the hyperthermic temperature achieved, but that the immune system of the patient was also involved (Nauts et al. 1953). The results of several animal studies performed in the first half of this century lent credence to this hypothesis and expanded it to suggest that hyperthermia-induced tumor cell damage stimulated the immune system to kill the remainder of the cancer (Westermark 1927; Johnson 1940).